An in-depth look behind the curtain at Hollywood visual effects, the craft of storytelling, and the people who make magic for screens both big and small. Hosted by showbiz veterans and new media entrepreneurs Sean Apple, PJ Foley, and Efram Potelle. Warning! The Ten Giant Robots podcast is guaranteed to contain spoilers. We're professionals, so we need to discuss the finer aspects of the craft. We may also use “professional, Hollywood language” from time to time. Keep away from uninitiated ears. Apple is selling us something new! Who's buyin'? And we talk a little talk about talk shows and violence in movies, specifically Kingsman! Episode 6: We continue our journey into our Hollywood destinies while Sean tries to recall all the times he's been fired. Meanwhile, Efram just chooses to win his way into your television. We talk about what it takes to get “that big break.” What does that mean? And who's been doing a lot of lording? And does your break need Star Trek? 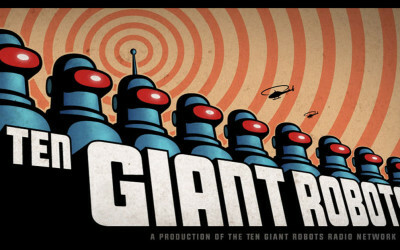 Ten Giant Robots is a Podcast! The words hung in the air for a moment, and then agreement was struck. We all thought we could. But did we? No, not for months. A little discussion was had here and there, of course. But would the idea come to fruition?